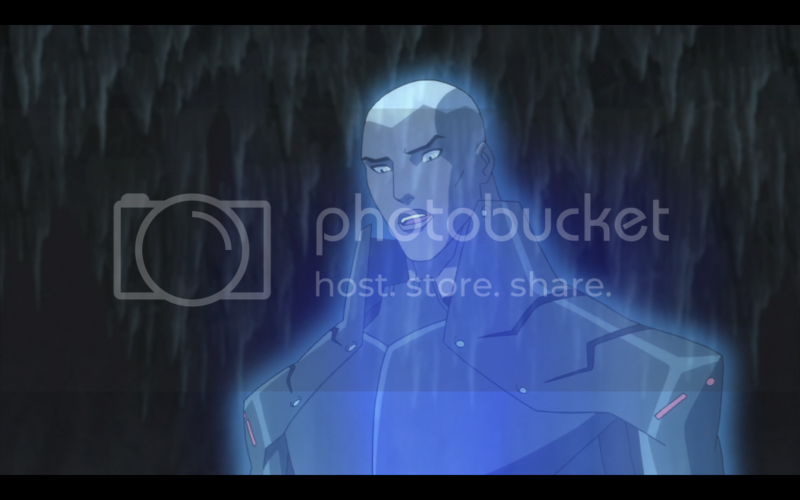 The Light and the Reach meet together to discuss recent events in their plans. 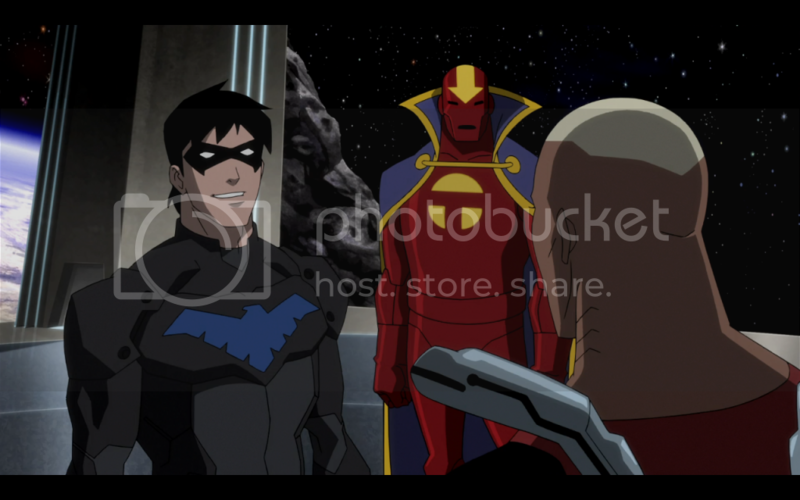 During the meeting Aqualad and Artemis’s cover is blown. 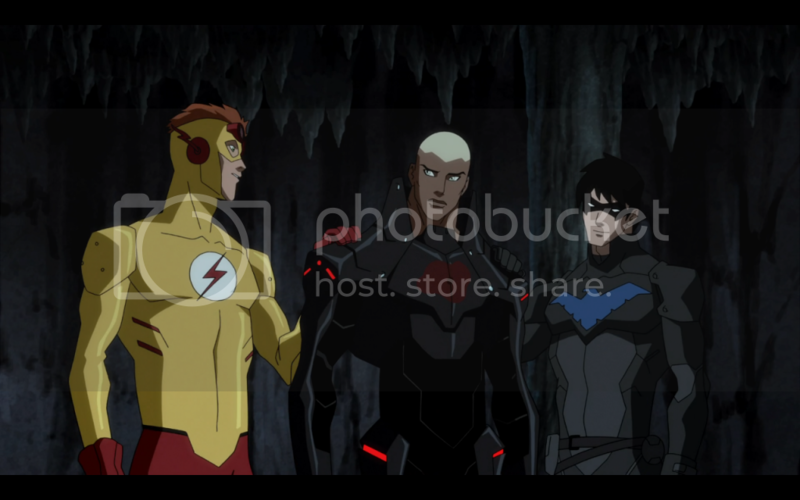 The two are executed by Deathstroke, but Aqualad still manages to reveal the Light’s treachery to the Reach. 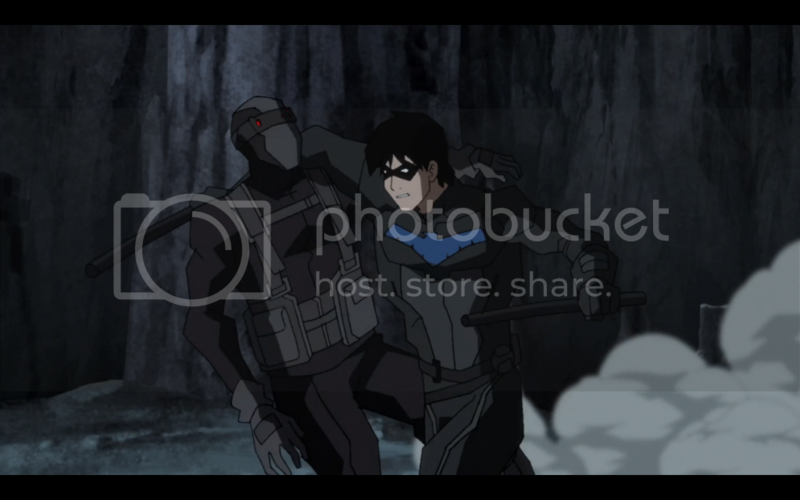 Aqualad and Artemis turn out to still be alive, and Deathstroke reveals himself to actually be Miss Martian in disguise. The team attacks, while the Light call in their reinforcements. But those too have been infiltrated by the team. They three sides fight, with several key members of the Light and the Reach escaping, but the rest are taken down by the team. With the evidence they recover the Reach’s plans are revealed to the world and the UN rescinds their invitation to the Reach, allowing the Green Lanterns to return to earth. As Nightwing is releasing command of the team to Aqualad, Vandal Savage takes control of the War World, and heads to outer space. The Reach, now lead by Black Beetle, decide it is time to leave, but in order to leave no evidence of their actions behind they decide to destroy the world. 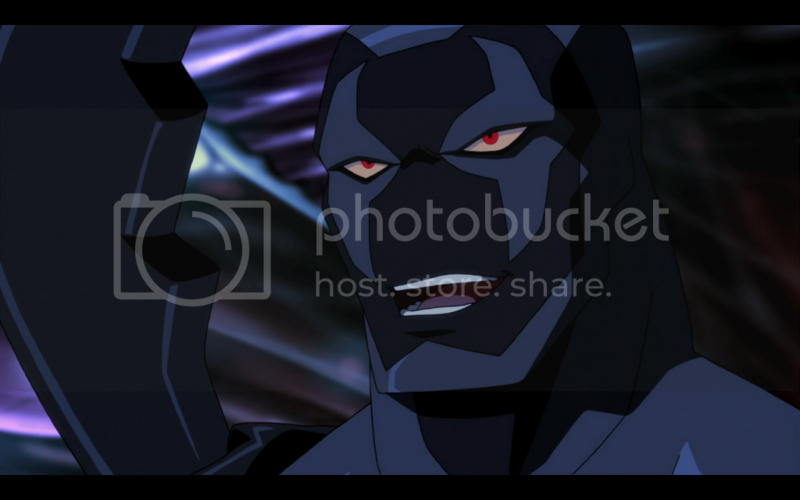 Episodes like this just make me angry Young Justice hasn’t been renewed for a third season. Sure season two has been a bit hit and miss in certain aspects, but this penultimate episode of the series was great. While it took place mostly in just one location, there was enough set up to make the pay off completely worth it. R’as al Ghul took the cake this episode. Granted he was taken out fairly easily, but the moment he recognized Artemis’s amulet as a glamour spell was the first “Oh snap!” moment of the episode. I was caught completely off guard when he went over and just ripped it off her. Normally this kind of event would be stretched out over several episodes, but R’as al Ghul is just so awesome that he won’t put up with any time wasting. When he sees something he goes for it. The battle between the team and the Light and Reach forces was absolutely stunning. The animation was as fluid as ever, but that doesn’t mean it doesn’t leave a big impact every single time I see it. I’ll miss this show, if nothing else but because animation of this crispness and fluidity just doesn’t get made often enough. 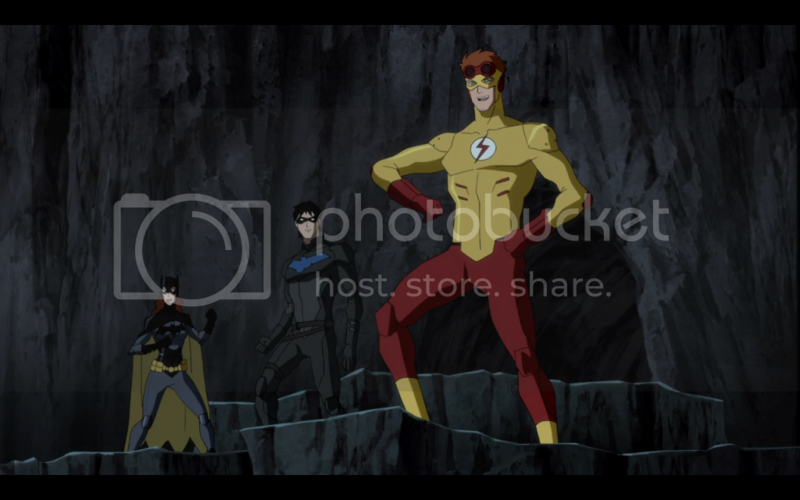 I can only imagine how much a single episode costs, and chances are that might be a factor in why Young Justice won’t be getting a third season. It’s a sad truth of the medium that animation costs a pretty penny, and if those costs aren’t recovered in DVD sales and merchandise then there’s little reason to keep the series around. That being said, it might help if actual effort was put into selling the show on a model that works. I’ve been looking into getting the DVDs, but so far all I’ve found are DVDs with the minimum amount of episodes per disk, and a lackluster attempt at selling the first season just by collecting those DVDs together. The market has changed. Nobody is willing to spend their hard earned cash on individual DVDs of a show. If you actually want to sell your DVDs, you need to package them by season. You can’t do whatever you want and then act like it’s the show’s fault when nobody wants to purchase your inconvenient product. People are under no obligation to buy anything they don’t want. So if they don’t to buy cartoons in the old format then unfortunately you aren’t going to make any money. And you’ll continue to make no money because you’ll continue making the same mistakes with other shows. 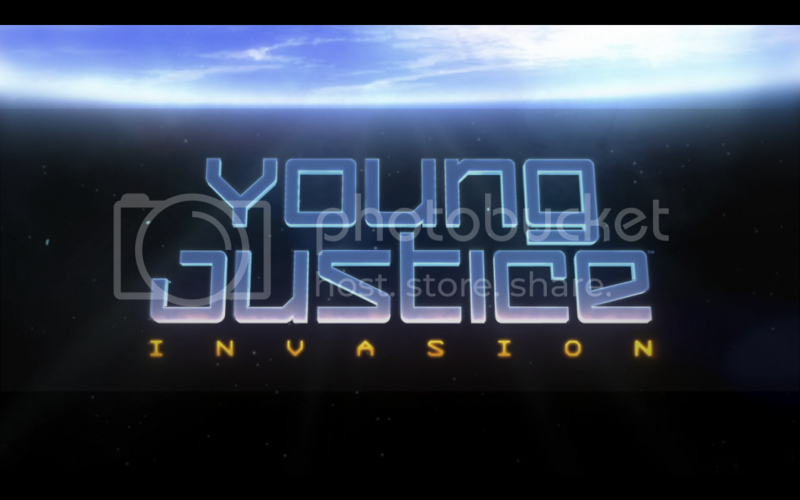 I hope Young Justice will get a third season. From what I’ve heard it’s not that the show has been outright cancelled, it’s just not been renewed for a third season. And while that basically means the same thing, it’s not entirely impossible that we will get a third season somewhere down the line. 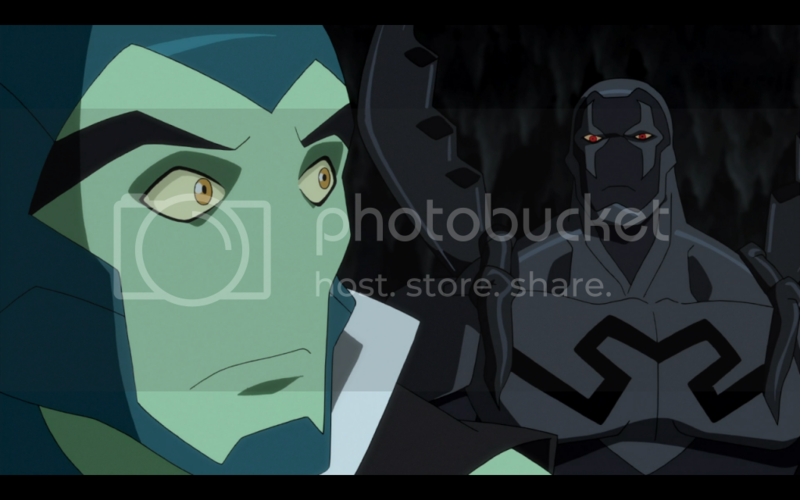 Then again, this is a Greg Weisman show, and as much as I love pretty much everything he’s ever touched, I can see the writing on the wall, and it’s saying Weisman doesn’t get third seasons.